Grilling...a favorite pastime...the smells, the deliciousness, the camaraderie. Many people have preferences of grilling with either charcoal or gas, but maybe you've been thinking about getting a ceramic grill and are curious as to how they compare. Humans have been using clay vessels to cook food for thousands of years. Modern-day kamado style grills have taken the clay outdoor ovens of the past and updated them by using advanced ceramic materials, and other innovations such as dampers, grill surfaces, ceramic cooking surfaces, etc. These modern-day ceramic grills have many uses. In addition to grilling, they can be used as an outdoor oven or an outdoor smoker. These multipurpose grilling devices offer a great deal of cooking flexibility so you can let your creative juices flow! There are many advantages of ceramic grills vs. traditional grills. Cooking on ceramic is a totally different cooking experience. Ceramic grills have the ability to quickly heat to a much higher temperature which allows you to sear meats properly and then cook them at a lower temperature. The special dome shape and ceramic materials used in the construction of ceramic grills, allows for more efficient use of charcoal, and retains heat much better than traditional grills. This helps meat hold moisture, and opening the grill to add sauce or cheese to meats does not lower the temperature of the ceramic so cooking temperature resumes within about 30 seconds. Ceramic grills also cook from all sides, not just the bottom like traditional grills. Another advantage is, rather than having a traditional grill and a separate smoker, a ceramic grill combines grill, brick oven, and a smoker for direct or indirect cooking. 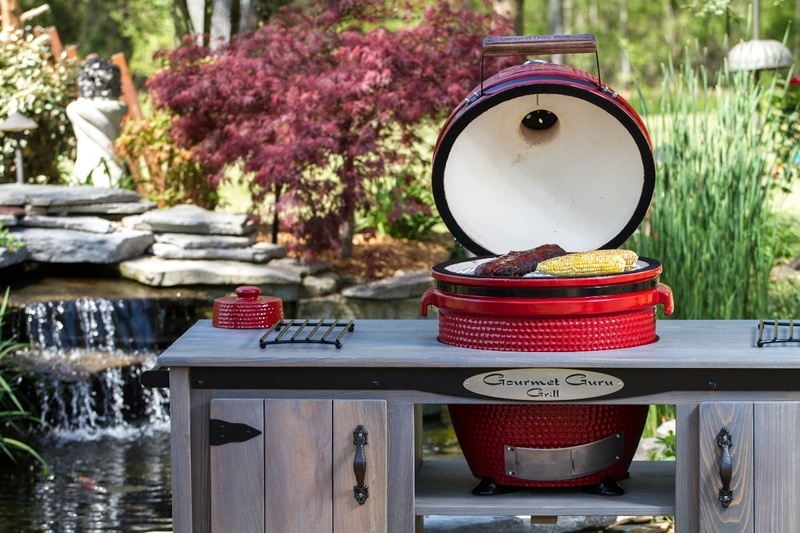 The Gourmet Guru Grill is a competitively priced, high-quality ceramic grill. We also offer many accessories to enhance your overall grilling experience. Anything from our beautiful deluxe cabinet made from real cypress wood, to a ceramic plate setter, to grill covers, to caster wheels...we have what you need. Looking for some wonderful recipes? Check out the tab “Jack's Recipes” on our website for a variety of delicious tried and true recipes for anything from appetizers to desserts. If you have any questions or would like to see one up close, use our convenient dealer locator to find a dealer near you. If you are ready to get grillin', then place an order on our website!